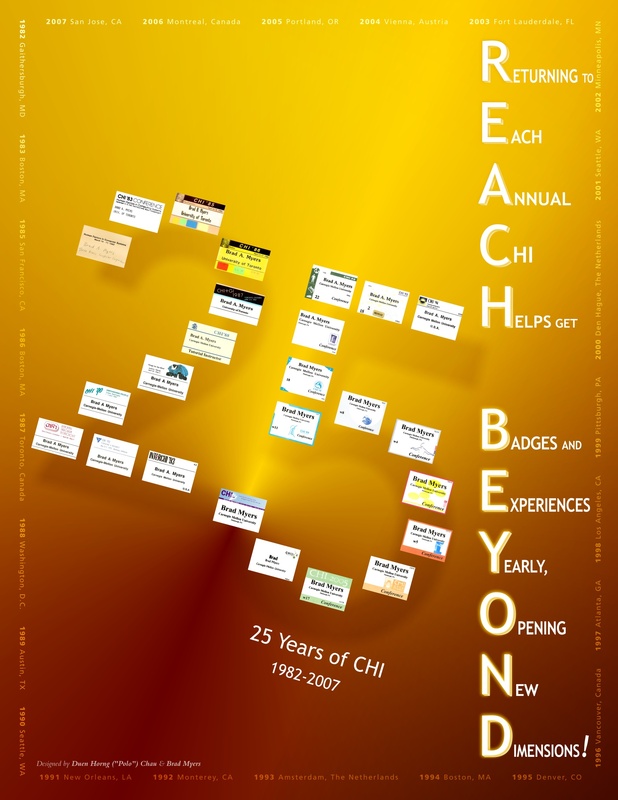 CHI 2007 25th Anniversary Competitions - Win Free Registration! Submissions are now closed. View the posters below and then go to http://chibuzz.ist.psu.edu/?q=poll to vote for your favorite poster! Do you wax nostalgic over the past 25 years of CHI? Do you think you know where CHI will go over the next 25 years? WOULD YOU LIKE TO ATTEND CHI2007 FOR FREE? If you answered yes to any of the above, enter the CHI 2007 Anniversary Competition. All you have to do is make a poster or share some words on the past or future of CHI and you'll be have the chance to win free registration for CHI2007. Eligibility: Open to everybody that feels like part of the CHI community. General Guidelines: Only one entry per person will be accepted for the poster contest. 1st prize: 1 free registration (independent of the number of authors) and the printing of the poster to be given to all conference attendees in their registration bags. Judging and notification: Everybody that registers at CHI Buzz will be able to vote. Voting will be open from March 27th to April 15th at 23:00 Pacific time. If a sufficient number of votes are not submitted by the deadline, the Conference Committee will make the final decision on the winners. Publication: All winners will be noted on the CHI 2007 website. Theme: The next 25 years of CHI. General Guidelines: Only one entry per person will be accepted for the writing contest. Specifications: Freestyle writing submissions, between 250 to 500 words. 1st prize: 1 free registration (independent of the number of authors) and the written piece will be published and given to all conference attendees in their registration bags. Judging and notification: Everybody that registers at CHI Buzz be able to vote. Voting will be open from March 27th to April 15th at 23:00 Pacific time. If a sufficient number of votes are not submitted by the deadline, the Conference Committee will make the final decision on the winners.